Ponniyin Selvan (Cauvery’s Beloved Son) is a recreation of the historical epic story of the Chozha Empire’s greatest monarchs (King Raja Raja Chozha). In the 10th and 11th century C.E, the Chozha dynasty was one of the most strongest and longest ruling Tamil empires, spreading from the Tungabadra river in Northern India down to Srilanka. It is also claimed to have had a stronghold over several other parts of South-east Asia. long-lost history of this dynasty has been beautifully refurbished by Kalki Krishnamurthy, a notable Tamil writer and journalist. The literary merit and the historical significance of the story is highly praised. I have heard my mother talk so wistfully about the story, ardently wishing she were part of that romantic era to behold all the happenings. And my dear friend has never recommended any other volume of books higher! Despite all these recommendations, I could never read the book because of my abysmal ability to read Tamil... that too literary Tamil :(. I knew I could never hope to get through all 5 parts of this voluminous and intricate story by reading one script at a time and stringing together words! So I abandoned the hope years back. However, my friend’s wonderful post tantalized me to get hold of the English translations. And I did! I am aware that I am missing out on several literary gems because of reading a translation of the great work, but I have to say, I am still impressed and quite hooked to the series! Project Madurai has the electronic versions of the first two volumes of the story (New Floods, and Whirlwind), translated by Indra Neelameggham. Although parts of the translation are literal, and some contain the actual Tamil words (like “Akka” (elder sister), “Thambi” (young man, younger brother), “Chee” ( tamil equivalent of “yuck”), etc. ), overall the quality is quite good, and the history is well explained. Indra Neelameggham manages to capture the poetic and lyrical nature of the text and delivers it well. I can only imagine how striking the original would be! As for the plot, Kalki weaves the story around the brave, charming, and heroic young man, Vandiya Devan, who is a trusted messenger of the then Crown Prince Aditya Karikala, and the beloved Princess, Kundavai. The current monarch, Sundara Chozha is in his death-bed, and as always, political conspiracies rage around him to capture the throne. Adding to this, the rival Pandiya men are scheming a dangerous and treacherous plot to overthrow the entire Chozha Empire. Despite all the challenges and dense political plots, Vandiya Devan manages to be a resourceful man to help Princess Kundavai and the monarch. In this first volume, all the characters get introduced and the stage is set for the story to develop. I am amazed at the layers of suspense tied to every character and at every turn of the page! Yet, the tale is not convoluted or difficult to follow. It’s thrilling and immensely entertaining, with elements of suspense, political intrigue, drama, mystery, romance, comedy and adventure! And just like any great epic, the huge jigsaw puzzle is slowly taking shape. This also yet another segment of history that portrays the power wielded by women! As much as the men scheme and fight their wars in the battlefield, the women shrewdly manipulate the game and have a caustic war inside the Palace. Kalki also brings to life the culture, traditions and religious fervor of the era. It’s incredible that the tussle between the Shaivaites and Vaishnavites which was prevalent in that time-period, continues to this day! 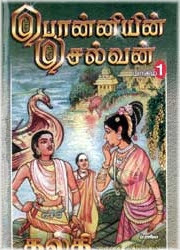 This volume ends with Vandiya Devan successfully meeting Princess Kundavai to deliver the message from the Crown Prince, and embarking on another mission to deliver a message to the younger prince, Arulmozhi Varma (later known as Raja Raja Chozha) who is in Srilanka on a political campaign. Since I am sure to have plenty to prattle about, I thought I would write a little about every volume I read (and hopefully not divulge all the suspense). And of course, the final rating is reserved for the end of the series!